This skill will target 3 random enemy. however, when enemy is 1, it not attack 3 times. While fireball attack 2 times. Maybe it’s by design? The wording is different. Fireball says 1 to 2 random targets but Arcane Barrage doesn’t say 1 to 3 random targets. It just says 3 random targets. Maybe you need 3 targets to get the full effect? Similarly, Arcane Blast hits all 6 monsters but if there’s only 1 monster it does not hit it 6 times. In any event, good to know. 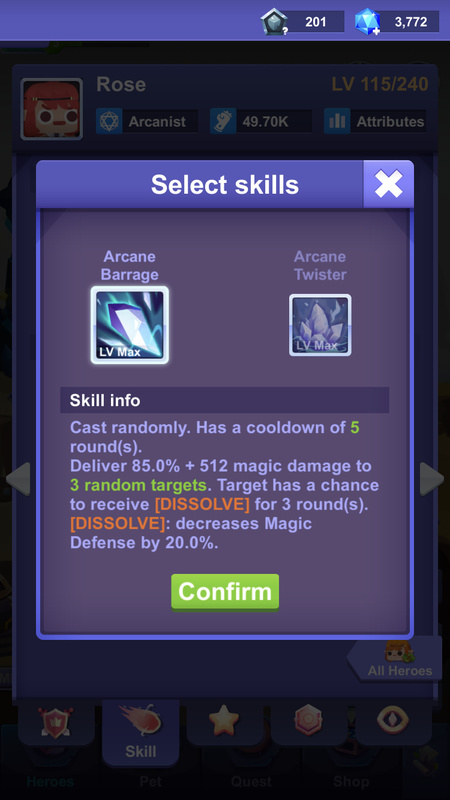 I still have a mage that I have not evolved to 6 stars. Thanks for sharing! by design, think of it like warlocks curse. It will only hit once per hero. If it not hit same target, arcane blast seems to be better. I pick this because text is similar to fireball and I think it use same machanic. 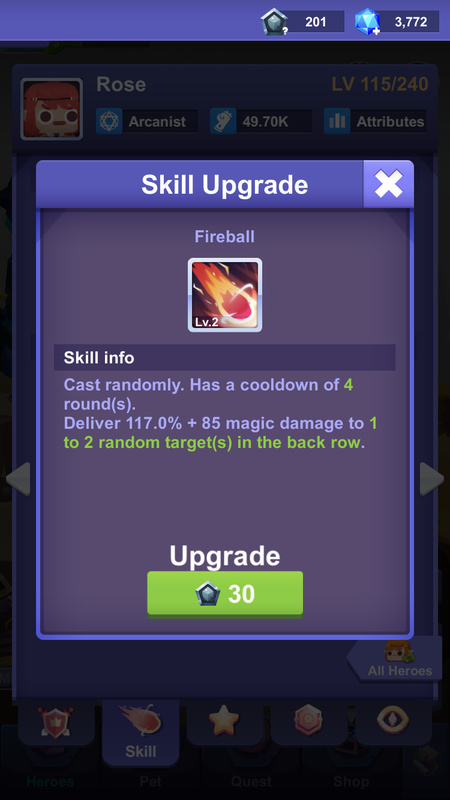 however, fireball can hit same target? Arcane blast sound like AOE magic which damage all field once. warlock curse is line magic attack which hit all in the line once. I think of it this way, maybe. Fireball: Two attacks. Might hit 2 targets. Might hit 1 target twice. Like 2 tank guns each fired independently. So description says 1 to 2 targets. Arcane barrage: Three attacks. Cannot hit same target twice though. Like artillery meant to spread out over battlefield. So description says 3 targets, not 1-3, even though when only one target left it will only hit one. They just didn’t have the room in the description box to be more clear and specific. Can totally understand why you might think it should behave otherwise. I’m not sure what I would have expected it to do with only one target, which is why I’m thankful that you told me. Good point. I think that it is probably working as intended. If was just difficult to describe in a limited space. Kind of like when entering descriptions for our guilds. A lot to say, and not many characters to say it. yes, and it cannot undo. 10% damage higher than arcane blast is not enough to select this skill. Perhaps the dissolve might still make up for it later on though? Arcane blast is better than barrage for arena, at least. This come from the frozen debuff. Fireball is the only skill in the game with benefit of hitting a target twice if it only hits 1 hero. You could actually make the argument that due to this fireball is the one that is broken.